Please note that this procedure will vary slightly from club to club. You should start the class by lining up, standing in grade order. Traditionally, the most senior students are the furthest from the entrance to the dojo (the place of greatest safety), and the most junior grades are closest to the door. When the instructor moves to a kneeling posture you should follow suit. Sit quietly in Seiza (kneeling position) and empty your mind of all thoughts, while concentrating on your breathing. When the sensei is ready to begin the lesson, the Sempai (highest ranking student) will say: Sensei ni rei (bow to the teacher). 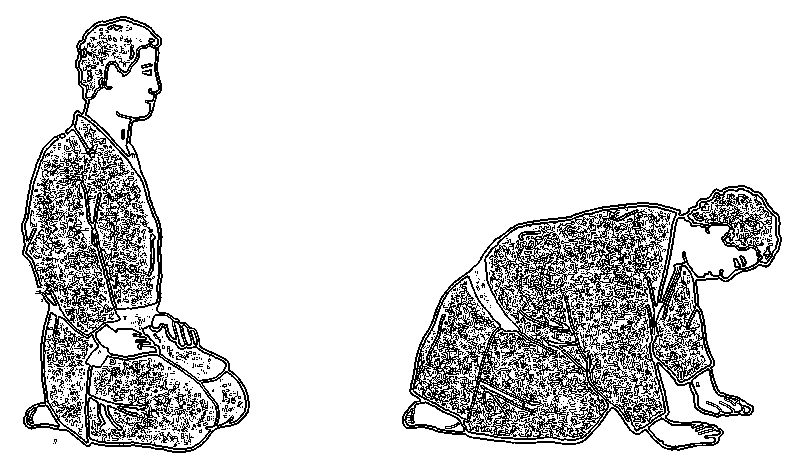 All students then perform a kneeling bow in unison, and return to seiza. All students then bow a second time, saying together: Onagai shimasu (please assist me / us). Line up standing in grade order. When the instructor moves to a kneeling posture you should follow suit. Sit quietly in seiza, close your eyes and breathe deeply while emptying your mind of all thoughts. When all are ready the sempai will say again: Sensei ni rei. All students then bow in unison and return to seiza. All students then perform a second kneeling bow, while saying, Domo Arigato Gozaimasu (thank you very much). You should start this bow kneeling in Seiza. Your hands should be resting on your knees. Female students sometimes place their hands on their thighs. At Mountain Warriors, we use a two-step method of placing the hands. Take your left hand forward and place it palm down and pointing into the centre about 6 inches in front of your knee. Now do the same with your right hand while lowering your head towards the mat. You should lower your head so your face is parallel to the mat that you are able (with your peripheral vision to see all the way around your body. As you come up, lift your right hand first, and then your left hand. The explanation for this, is that a warrior would normally secure the saya (scabbard) with his or her left hand, while taking the tsuka (hilt) with the right hand to draw the sword. Placing the left hand down first would make it very difficult to draw the sword. This two-step method was therefore traditionally felt to demonstrate trust and etiquette. Other martial arts schools place (or slide) both hands to the floor at the same time. You should start this bow standing in Shizentai (natural stance). Your hands will be hanging naturally at your sides. (Some schools start Ritsurei in Gassho – a position used for greeting, with the palms together and fingers pointing upwards in prayer position). You should then bow from the hips / waist and keep your back straight. It is not correct to bob your head down; your head and spine should form a straight line at all times. Your hands should slide naturally down your thighs as you bow. Different schools have different views on whether you should maintain eye contact with your partner as you bow. Some believe that eye contact is sensible and appropriate, for the warrior’s own self-protection. Others see it as discourteous and inappropriate, as the rei is an expression of trust and courtesy. At Mountain Warriors, our view is that the bow expresses above all that we trust in our partner. In effect we are saying: I will lend you the use of my body so that you can learn; and I trust that you will do this safely and respectfully. We therefore follow the everyday Japanese practice of lowering the eyes during a formal bow (indeed, it would be considered rude in Japan to look the other person in the eye as you bow). However, as this is a martial art, we also teach students to ALWAYS be aware of maintaining proper ma’ai (combative distance); kime (focus) and zanshin (awareness), and to maintain peripheral vision in general. The height of your standing bow in everyday Japanese life is dictated by the difference in level between your rank and the person you are bowing to. In practice, an angle of about 45° is appropriate for a training situation.